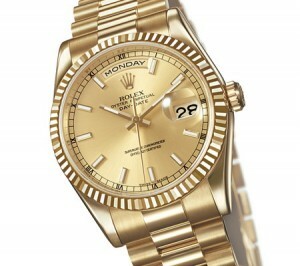 Rolex watches are a status symbol and are desired by consumers across the world. Bargain shoppers who want to buy an authentic Rolex without the new Rolex price tag can check with high end resale jewelers. However, it is important to be an informed consumer to ensure that you aren’t paying a Rolex price for a non-Rolex watch. Read on to learn how to spot a fake Rolex. 1. One of the most obvious signs of a knock-off Rolex is the way in which the second hand moves. In a Rolex, the second hand moves fluidly around the dial. In fake Rolex watches, the second hand usually has a jerky movement. 2. Another sign used to help you spot a fake Rolex is the glass cover of the watch. Rolex watches use a genuine sapphire crystal to cover the dial while faux Rolex watches use standard glass. An easy way to test this is to wipe a small bit of water on the face of the watch, if the water balls up then it is likely an authentic Rolex. 3. Check the back of the watch for the hologram sticker that is placed on all genuine Rolex watches. Some pricier knock-offs will attempt to imitate this, but lack the true hologram effect. When learning how to spot a fake Rolex, this is one of the easiest steps to take. 4. Look for an etched crystal Rolex logo located under the six o’clock position. You will likely need a magnifying glass to view this. If you see the logo and it contains smoothly etched edges, then you can be confident that the Rolex is authentic. 5. Check the area between the lugs on the side of the case for a serial and case reference number. Although many knock-offs attempt to duplicate this effect, the result is usually shoddy at best. An authentic Rolex will have precisely engraved numbers with smooth edges. 6. Use a magnifying glass to look at the lettering on the dial of the watch. To the naked eye, the lettering may look the same but under magnification the imposter will be easily revealed. 7. Check the back of the watch as Rolex uses what is called a “clear caseback” to display some of the inner mechanics of the watch itself. These seven tips teach you how to spot a fake Rolex. Considering that a used Rolex can still run several thousand dollars, it is important to purchase the product from a reputable company and consider having a Rolex retailer look at the watch to provide an expert opinion. This entry was posted in Authentic, fake, How To..., Rolex, Watch Buying Tips. Bookmark the permalink.